Today’s post is the first of an ongoing offering – Kathy’s Corner by BFL Spiritual Director Kathy Staudt. 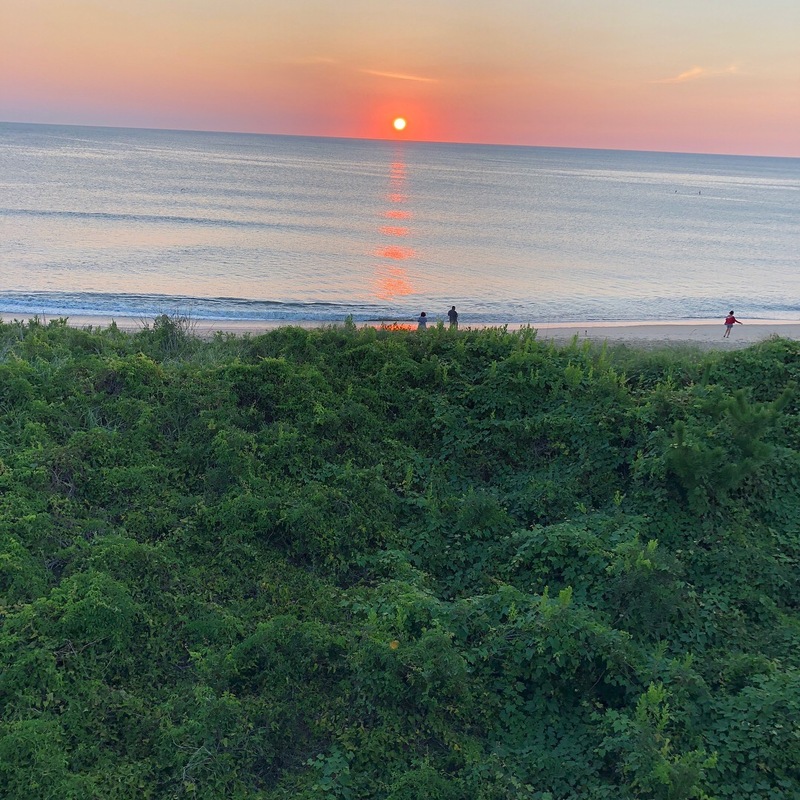 Most summers at the end of August – so far just on the edge of hurricane season though sometimes we’ve come close – we have spent a week on the northern end of the Outer Banks in North Carolina. This year we had a house right on the ocean and so I awoke every morning just before sunrise to a brightening horizon and the sound of waves. The rhythm of my days there became a meditation on the gift of water, here the salt water of the open Atlantic Ocean, a primal source of life, and the brackish water of Currituck Sound, less than a mile away on the other side of the island. The daily rhythm of my mornings became a way of prayer, surrounded on all sides by the water that gives life and can also overwhelm life. An account of my morning practice may help others share in the embodied experience of what the waters of Baptism might mean, an insight that that slowly dawned on me over the course of the week. I awoke each day just before sunrise, on a week when the ocean was smooth, and the waves rolled with a steady, present rhythm. I thought of the mystics who speak of the “ocean of God’s love” with its strong currents and waves, and its nourishing, refreshing waters. Watching the sun emerge each morning, always, somehow, a surprise just after the early dawn gloom, reminded me of that Baptism prayer: “We thank you, Almighty God, for the gift of water: Over it the Holy Spirit moved in the beginning of creation” (BCP 306). After watching the show, and celebrating the arrival of another day of clear, bright beach light at the sea, I would set out, each morning, for the sound, on the other side of the island but less than mile away. It is hot on the Outer Banks in August, even early in the day, so I filled my water bottle before I went with cold ice water, and as I walked, and sipped, I was grateful for the water that sustains and refreshes my life. Fulfilling some kind of stereotype (I know, I know), I would stop on my way at the bakery and pick up a paper copy of the New York Times, a bagel and a double espresso). With these I walked to the sound and settled on a bench, along a boardwalk which the town has created in an effort to preserve the wetlands on the sound. 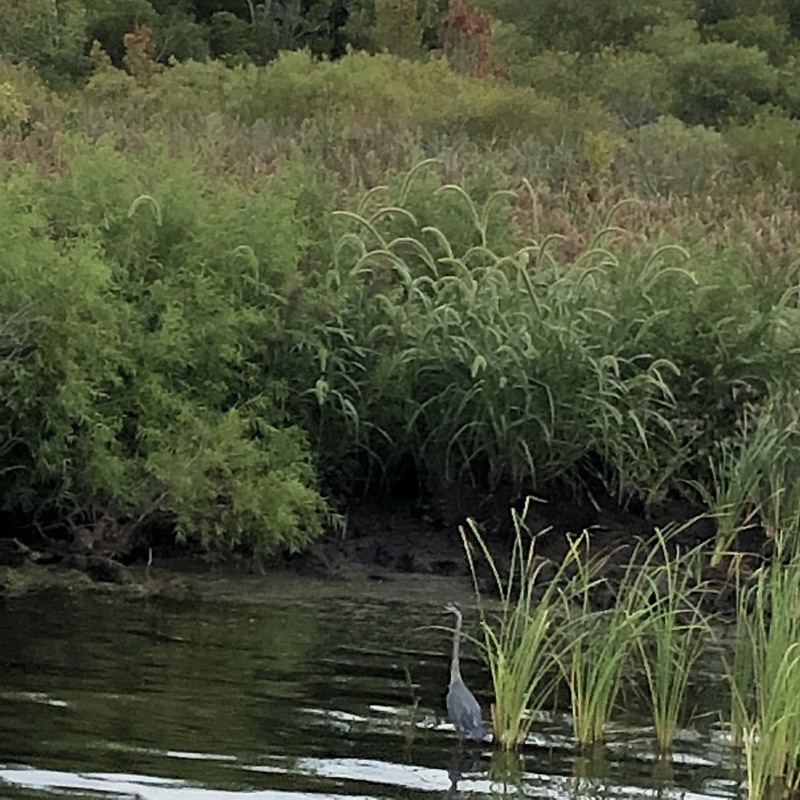 And the wetlands, indeed, are growing more dense and rich every year, together with a narrow but thick and deeply green fringe of maritime forest. Wetlands are a powerful symbol for me: that watery place where grasses and marsh flowers and reeds put down deep roots, filtering impurities out of the water and harbouring concentrated populations of new life: Crabs, herons, all kinds of tiny fish and insects live in this place and provide food, and the flowers draw butterflies and other pollinators – it is a place teeming with often invisible life, rooted in the water. Fallen trees, probably downed in hurricanes and floods, also provide sources of nutrients for the wetlands and so it is a place where the cycle of death into new life is visible. And I would recall some words about the water of Baptism: In it we are buried with Christ in his death. By it we share in his resurrection. Through it we are reborn by the Holy Spirit. (BCP 306). Working with congregations to equip people of all ages to claim their baptismal identities with confidence and joy.